At the Pedagogic Research Conference, held at the University of Brighton in February, the eLearning team presented some initial results from the Learning Analytics pilot which are presented below. The Learning Analytics Pilot is capturing student data including attendance (and non attendance) at seminars. This is a joint pilot between the eLearning Team and the Brighton Business School (BBS). In this graph a student’s score (out of 100) is plotted against their total number of attendances recorded for Semester 1 (2016-2017 -approximately 10 weeks). Each black dot represents a student’s score versus their total attendance over the first semester. The red line is a calculated Least Square fit to the data. Multiple attendances can be recorded for a single week. 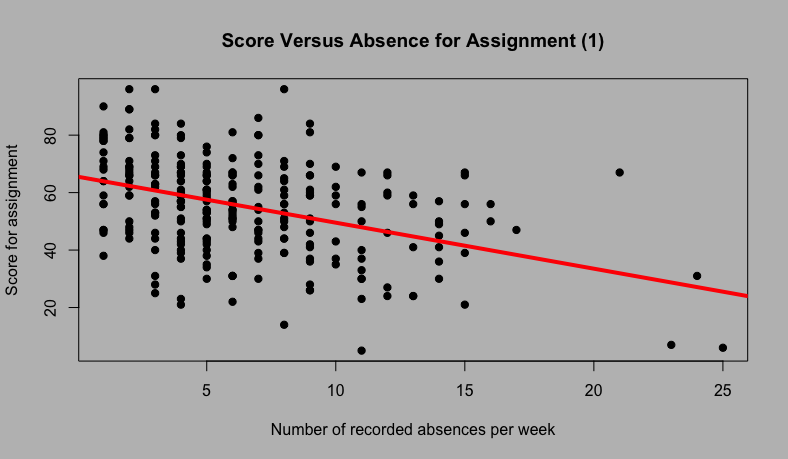 This graph presents similar data as the attendance graph but compares non attendance (absence) at seminars versus a student’s score in an assignment. Again the each black dot in the graph represents a student’s score and total number of absences over 10 weeks. A calculated Least Squares fit is shown as a red line. 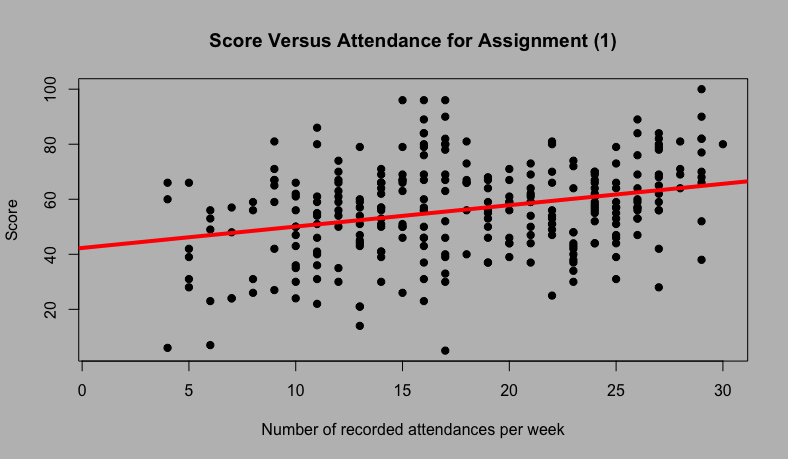 The first graph appear to indicate a correlation between attendance and attainment/score for an assignment. A higher attendance value appearing to indicate a higher score for the assignment. Similarly a higher record of non-attendance (absence) at seminars over the semester leads to a lower score for the assignment. These are initial results and clearly there is some scatter which will be a further area of investigation. The elearning team are also providing students with a student dashboard. This part of the pilot is available to approximately 70 students in the Business School. The dashboard includes a How Are You Doing widget and a set of graphs to summarise a student’s activity, grades and attendance. The eLearning team were interested in seeing whether students would use a dashboard. 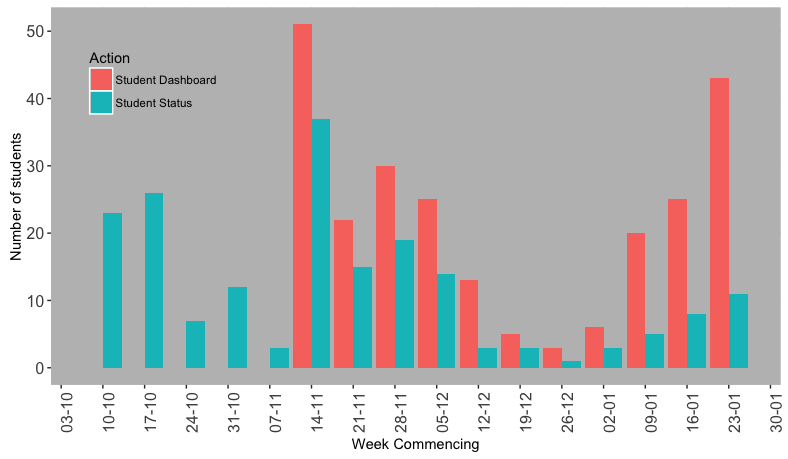 The following graph shows the usage of the widget and dashboard over the first semester. The student dashboard wasn’t introduced until mid-way through the semester. The How Are You (student status) widget was introduced to students near the beginning of the Semester. These results indicate that at peak times (e.g. assessment feedback times) over half of the students did use the dashboard to see their own results and compare with the average score for the cohort. The eLearning team ran focus groups with the students and some feedback is included on the BBS blog. We are continuing with the pilot and will publish more results. Hi I am a Learning Technologies Adviser at the University of Brighton.